Synopsis: What is Lent all about? Is it about refraining from chocolates or coffee? Is it about fasting till our face turns blue? Or is it about a turning toward an invitation to spiritual maturity? In this week's article, I want to focus on the four pathways of holiness, to learn to live in greater spiritual maturity as well as growing discernment of the ease of entanglement with the worldly; the focus of attention on the Cross; the the joy of perseverance in faith. That we be complete in Christ. Lent has begun. Ash Wednesday two days ago marks the traditional kickoff with forty days to Holy Week, also known as Passion Week where Jesus entered Jerusalem en-route to the cross. During this time, many believers make special efforts toward a more intense and intentional doing of one or more spiritual disciplines. It could be prayer. It can be fasting. For the latter, some contributors to ChristianityToday recently checked on the Twitter world to reveal the five most popular things to fast from: "Chocolate, Twitter, school, alcohol, and swearing." When I saw the list, I cannot help but wonder if these people will start swearing again after Lent. A) Lent as Giving Up Some Things? There is also another list which tries to classify the tweets in terms of categories of things people are seeking to give up during Lent. As I go down the list, I cannot help but wonder how many of these people are Christians. At the end of the article, I felt something seems amiss. Honestly, these efforts to fast from various things tend to miss the point of Lent totally. The purpose of Lent is not the fasting or the refraining. Neither is it some kind of a contemporary sacrifice of modern comfort so that we can experience a piece of Christ's suffering now. No. Theologically there is no need to do that, for Christ's sacrifice is already all-sufficient. No one can add or subtract from it. That is why Jesus said just before his death, "It is finished." His work of grace and salvation is finished at the cross. The purpose of fasting is to disentangle ourselves from things that easily hinder us from our pursuit of Christ. Looking at Hebrews 12:1, if the giving up of some things during Lent is a way of throwing off anything that "hinders," so that we can run the race set before us, it is a good thing. B) Lent as a Shifting of Focus? Lent is an intentional time of walking with Jesus, of talking to God the Father, and of sensing the moving of the Holy Spirit in our midst. It is not the taking away of something we have. It is the putting on of something we do not yet have. Amy Julia Becker gives five reasons why Lent ought to be observed, and all of them has to do with some kind of shifting. Firstly, in looking at the Church year, we learn to shift from merely living day-to-day and to learn at living season-by-season. Lent is that season in which we learn to focus more on the cross as we anticipate the Great Resurrection of hope. Daily work can be repetitive. Seasonal awareness puts the repetitive within a framework of a larger picture. This is a shift from daily wanderings to seasonal ponderings. This helps us maintain a helicopter view so that we do not miss the forest for the trees. Secondly, amid the fasting, there is a celebration that we look forward to each Sunday. Becker sees the shift from fasting to feasting as a weekly celebration of joy amid the other six days of fasting. This is a shift from mundane toil to sustained remembrance of joy unspeakable. Thirdly, fasting reminds us about how we have become so glued to ordinary things. Perhaps, the fasting from it enables us to be more appreciative of these things. Absence makes the heart grow fonder right? This is a shift from enslavement to the worldly things to freedom in Christ. Fourthly, without the distraction of the items we are fasting from, we can fill it with spiritual practices. Maybe, it can even cause us to find new strengths and opportunities from the tools we hardly use. This is a shift from using our normal tools to using lesser used gifts in our spiritual toolbox. Fifth, Lent is a time to be counter cultural. I like this one in particular for it is so reflective of the gospel. Remember how counter cultural the Sermon on the Mount is? This is a intentional shift away from worldly perspectives to the heavenly one. Essentially, my read is that Lent is about shifting our attention back to the Cross. Hebrews 12:1 reminds us that there are things that "easily entangles." It is precisely because of this temptation that a shift is so necessary. Is Lent just about shifting? Not really. There is more. Lent is for me a reminder that all believers are to embark on the path toward spiritual maturity in Christ. It means not just walking with Jesus, but walking with Jesus toward to goal. It does not mean paying more attention to God, but paying attention in such a way as to cultivate a maturity in Christ. It does not just simulate Jesus's way to the Cross, but situate the carrying of the Cross as a disciple of Christ. It is not the mere doing of spiritual disciplines but how the working out of the disciplines help cultivate in us an absolute obedience to do the will of God. Hebrews 12 paints a vivid picture of a race set before us that we can run with perseverance. 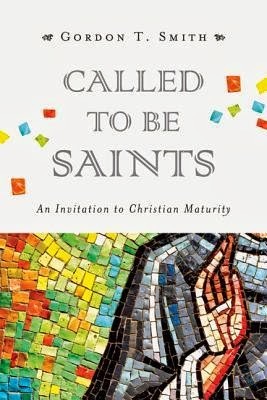 In Gordon T. Smith's recent book, "Called to be Saints: An Invitation to Christian Maturity," Smith identifies four pathways to run to maturity. The first is the pursuit of wisdom. Mature Christians are those who live with wisdom as a guideline to life. With Scriptures as guide, the believer cultivates a heart and mind that responds with Scriptural accuracy in word and in deed. Smith calls these as people of "sapiential holiness." The second is a deep sense of calling. This can also be called vocation and Smith makes it a point to distinguish this from mere "career" or "job." Job is a temporary sprint while calling is more of a marathon. With the deep sense of calling, you can take the job away from the man, but the man will keep working at the calling. Smith labels these as people of "vocational holiness." The third pathway is via the way of love. It is not just about what we do in life. It is about how one does it. This pulls in the importance not just about living in community but how to bring about a community of love. For love is the fuel for a vibrant community. The one who loves well is on the path to maturity. Smith calls these people of "social holiness." The fourth pathway one of joy. This is often missed out in our race for efficiency and productivity. The lack of joy makes living and exercising of the spiritual disciplines very toilsome and laborious. Our world is already a broken and often painful one. We do not need to search for pain and hurts for in due time, they will come seeking after us. This makes the centrality of Christ and the Cross even more significant. Smith calls these people of "emotional holiness." Lent is another season for us to accept the invitation to Christian Maturity.